A New York judge said he will hear arguments later this month over whether records should be released from the grand jury proceedings that declined to charge the officer involved in the death of Staten Island man Eric Garner. At a hearing on Monday, Judge William Garnett said he will hear oral arguments from both sides on January 29 at the Richmond County Supreme Court in Staten Island. Several groups filed petitions for the release of the transcripts after the grand jury decided not to indict the police officer who placed Garner in a chokehold that led to his death, despite video evidence capturing the incident. The video of the July 17 confrontation got national attention for the NYPD’s disregard of Garner when he exclaimed “I can’t breathe” eleven times shortly before his death. The jury’s failure to indict Officer Daniel Pantaleo on December 3, who was seen applying the chokehold on the video, led to a steady campaign of protests and widespread outrage over police brutality. Among the groups filing for the release of the transcripts are the New York Civil Liberties Union, New York Public Advocate, New York Post and the Legal Aid Society. "Seeing the videotapes, all of us know what's at stake. All of us want to know more and are entitled to know more and the public advocate is entitled to know more about exactly what went on in that grand jury proceeding. And we intend to try to get that material," said Matthew Brinckerhoff, the lawyer representing the Public Advocate's office, told reporters outside the court. Judge Garnett told the court that Staten Island District Attorney Daniel Donovan opposes the release of the transcripts, but the judge said he will go by the New York State Constitution and law when he makes his decision. "At least we'll have some transparency," Gwen Carr, Garner's mother, said after attending the hearing. A previous judge initially sealed the application for the transcripts’ release, over objections by the NYCLU and Public Advocate Letitia James. The NYCLU took steps to challenge the constitutionality of the sealing order, and a Brooklyn appeals court overturned the seal request. A hearing was originally scheduled for Dec. 19, but was postponed after then-presiding Justice Stephen Rooney stepped aside from the case, according to Bloomberg News, citing his wife's position as chairman of Richmond University Medical Center, which employed the medics that responded to the Garner arrest. The NYCLU's application specifically requests that any personally identifiable information about the jurors, witnesses and employees of the office of the State Island District Attorney be redacted. 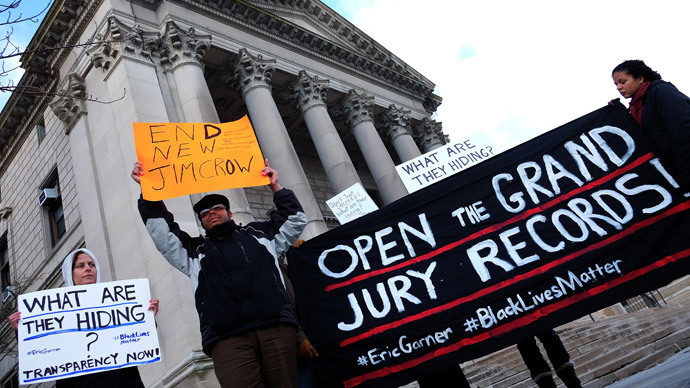 "Some matters that might legitimately be kept secret but the lion share of what went on in that grand jury room needs to be made public both in terms of what happened to the Eric Garner case and what is our future policy with regard to grand juries. Should they continue to exist? Should they continue to function in secret? Should they be open?" New York Civil Liberties Union Executive Director Donna Lieberman told reporters.